Ever since James Naismith invented the game of basketball in 1891, players and fans have been keeping track of the stats using the tried and true method of keeping score. The National Basketball Association was founded in June of 1946. 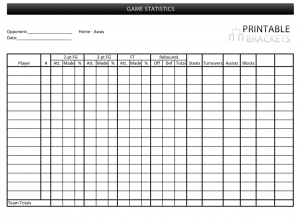 Fans have been following the game using a NBA score sheet for the 65 years since. You can just take one look at an NBA score sheet from any game in history and get a feel for how that game played out. It’s not as popular as a Major League Baseball score sheet and it’s not as commonly reviewed as a National Football League box score, but to basketball fans there is nothing better than sitting down and going over a NBA score sheet. You can take a trip back in time and visualize how a game went down. You can be a part of a game that you weren’t even old enough to see. For example, take a look at the NBA score sheet from a game that took place in Hershey, Pennsylvania on March the 2nd 1962. The Philadelphia Warriors lined up to play the New York Knicks. The starting lineup for the Warriors that day was Paul Arizin, Tom Meschery, Guy Rogers, Al Attles and a Hall of Fame center who went by the name Wilt Chamberlain. In this historic game, the Knicks had two players score over 30 points. Cleveland Buckner, Willie Nauls and Richie Guerin led the Knicks to a very high score of 147 total points. However, this wasn’t the big story of the game. For the Philadelphia Warriors, Wilt “The Stilt” Chamberlain would set history by scoring exactly 100 points on the night. That is in the record book and will remain there forever. If you take one look at the NBA score sheet from that game then you will that his teammates helped out. Rogers, Arizin, Attles and Meschery dished out assists and pulled down rebounds to help Wilt make history.